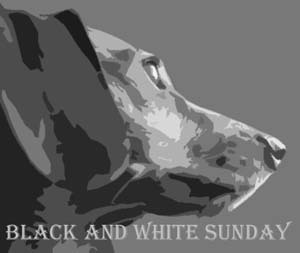 Thanks to our hosts of the Black & White Sunday blog hop: Dachshund Nola and Sugar the Golden Retriever. The snow is a perfect background for Bella! Gorgeous girl. Love the contrast. That is the problem with winter - it is so white! Beautiful picture! We wish we had some of that snow to play in! That picture is beautiful! Wordless Wednesday 122 - Hi there. Wordless Wednesday 121 - So cute. WW 120 - What do you mean "bird" feeder? Trust That We Can "Save Them All"
Wordless Wednesday 118 - Happy New Year!